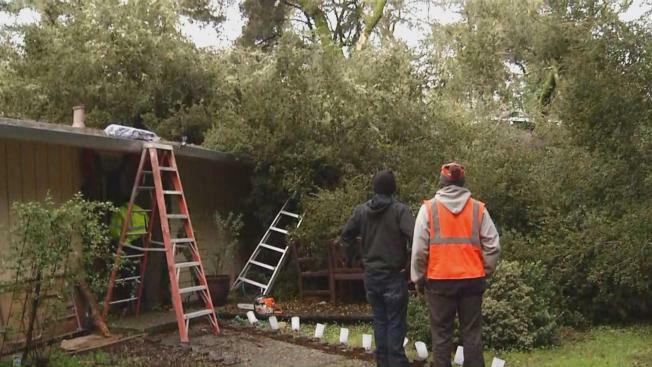 The latest storm knocked down trees all across the Santa Cruz Mountains this week, and one huge oak tree landed on a home in the Bear Creek Country Club area of Boulder Creek. Travis Tree Professionals were at work Wednesday, removing the tree, which managed to puncture the house owned by John Oliver. "This is our bonus room and laundry closet, and this branch came through inside the closet, through the roof and through the walls and took out our door right there," Oliver said, looking at the damage. "We've had water just pouring in." Oliver said his wife and kids were still away on vacation. He came back early for work. Otherwise, everyone would have been home when the tree came down. "If the tree had fallen another few degrees this way, it would have caused real structural damage," he said. Bob Pilgreen of Travis Tree Professionals said there's so much rain that the ground can't soak it up fast enough. "The big trees just don't have enough root system to hold up a big tree when there's a big mud ball around it," he said. Meanwhile, many Boulder Creek residents received a bit of positive news about their water supply, which had been compromised when part of Bear Creek Road collapsed. The San Lorenzo Water District finished installing a bypass pipeline near the collapse, just in case the main pipeline under Bear Creek Road gets damaged in the next storm.